February 12, 2014  Speaking to university students in Florida, Clarence Thomas also said that "the worst I have been treated was by northern liberal elites." 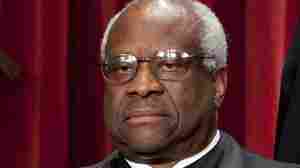 January 18, 2013  Known for not speaking from the bench, Justice Clarence Thomas spoke four words this week. For the record, here's what it sounded like. 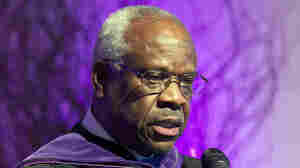 Justice Clarence Thomas Speaks, Many Listen; But What Was He Saying? January 15, 2013  Did he make a joke about Yale? Was it a sign he's still bitter or growing more comfortable with the fact he went to law school there? And what prompted him to speak into his microphone on the court's bench for the first time in nearly seven years? Court watchers have many theories about four words. October 22, 2010  Virginia Thomas' request that Anita Hill apologize for accusing Clarence Thomas of sexual harassment during his Supreme Court confirmation hearings in 1991 has prompted Thomas' former girlfriend to break her silence about the man she used to date. October 8, 2010  On this day in 1991, seven Democratic women from the House march over to the Senate to demand a delay in the confirmation vote for Clarence Thomas, who is accused by Prof. Anita Hill of sexual harassment. October 2, 2007  I was a White House Correspondent ... I was at home at 10:00 one Sunday morning when a White House contact called to "give me a heads up" that something was afoot with Thomas' nomination.